Gregory Burke, Peggy Gale, Sylvie Fortin, Erik Bordeleau, Brian Masumi, Erin Manning, Toni Pape, Roland Rose-Antoinette, Adam Szymanski, Alanna Thain, Mark van Schlegell, Gene Moreno and Benjamin H Bratton, Richard Rigby and Marilou Lemmons. 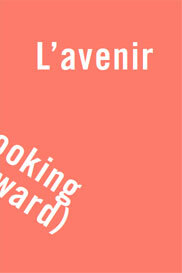 Catalogue text contribution for the Montreal Biennale catalogue L’Avenir, 2014 curated by Gregory Burke and Peggy Gale. Our inability to predict and know with certainty if our actions can give form to a future society that is progressively different from our present one has profoundly cast an art that would call itself political or critical as tragically heroic. This art, inheriting the ambitions of the left instead of planning for real difference, witnesses its own failure in the “self-consciousness trap” of internally assessing its own lack in the face of the “future impossible”. This articulation of the future is pathological, naïve and contradictory. On the one hand, the future is held in a radical non-relation to the present, it is a place that we cannot know or reason. At the same time, knowledge maps and guards this space of the future as alien, preventing access to it. This knowledge suspiciously knows all too well that we have no transcendental guarantees for our actions, and that there are no ascertainable grounds from which we can build a future.